Home » » An another step of NAFSO Alternative Economic Delopment Programme. An another step of NAFSO Alternative Economic Delopment Programme. This programme was funded by National Fisheries Solidarity Movement (NAFSO) under the direction of AED officer Mr. Pradeep Wanigasuriya. 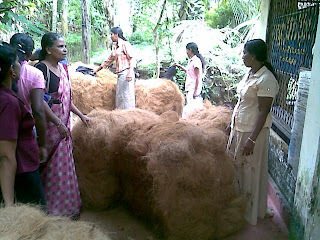 According to him the objective of distributing this coir bales, to sustain their family economic back ground, which had been collapsed by tsunami disaster. In addition to that they can earn an extra income to the family without depending on fisheries industry helping husbands also. District coordinator and the animator of the Hambantota “RDD” organization selected these beneficiaries from Unakooruwa GS division of Tangalle DS division in Hambantota District. “Before we join with Ruhunu Deewara Diriya Oranization, we were borrowing money form the rich man of our villages for buying coir and we had to give back our coir productions to him to repay our loans. We are very poor fisher women and we were exploited by such rich men in the name of helping us. 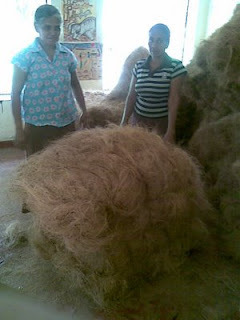 We paid big interest for the money but now our lives have been changed and we can sell our coir to any one we need”. Fisher women Rozelin (55) added. “We can earn an additional income to our family and this a very seasonable activity launched by this organization”. Kumari from Unakooruwa North.